Sounds perfect for a Crumb Quilt! Ami never sleeps! Note the time she sent this one out! Neat ideas for using thoses too-small scraps. Hey Bid! Here’s my secret: I usually write the blogs ahead of time and then set them to publish at a specific time. Not always, but most of the time. I’ve been thinking about doing something like this for awhile now. I’m in! What a perfect idea. I’m doing this. I have started doing this with my leftover pieces as well. My church makes quilts to donate to different charities in the local area. I use the 3 1/2 in squares to make 9 patch blocks which are then sewn into a quilt. Nothing is wasted and everyone benefits. Love it! Next time you finish one, Cheryl, send me a photograph so we can share it on the blog. I use crumbs but not while I’m making other quilts. Recently I took all my small scraps (1 1/2 by anything and 1 3/4 by anything) and strung them together at the ends. Then sewed the rows I got together. I got a big piece of fabric. I used fusible web and cut out large shapes from charm tacks designs and machine appliqued them down to solid squares. The squares got put together into a charity top for my guild. I am left with a piece of fabric which is large but not enough for a top yet. I’ll send photos via email since I have no idea how to post them here. Sounds wonderful, Diane. When you get it done, email me a picture and I’ll post it. As you said, there is no way for you to post a picture here to the blog, but I’ll be happy to do that for everyone. I have been cutting scraps into squares for years to use as “leaders and enders” and I use them when I make garments too because in that case you rarely chain stitch. These days I use a die cutter to cut all my patches (got arthritis) and that makes the scraps even easier to cut up. I don’t think I have enough scrap pairs yet to make a quilt this year but I will go on collecting. At some stage I plan to make 4-patches as “leaders and enders”. I try to sew a light and a dark square together but sometimes there isn’t enough of one or the other in the little nut-container I keep by my machine so I go for different colours instead. This is one quilt I want to keep for myself because it will contain some lovely memories of past projects I have made. Thanks to Scooter for the video. Loved it! Sounds like a perfect way to use up all those pieces I just can’t make myself throw away! Love the challenge. I have been making “crumb” quilts for years. My quilting friends save their crumbs for me or allow me to raid their waste baskets. Ah…another garbage picker. As long as you only raid trash cans in sewing rooms and workshops, I think you’re OK! Always good to have such nice friends. I just started a quilt to thank a neighbor for all the times he has come over with his snow blower while we are using shovels. Should be fun. I rarely throw away my batik scraps because I hand applique and always think I will use them. Since I am now on my third large container, I had better find another use for them. A Crumb Quilt could just be the solution you’re looking for! What a great idea! I can never throw away even the smallest piece of fabric and I have containers of fabric scraps everywhere! I’m in! I am joining in! I have plenty of crumbs and have been trying to decide on a pattern. This is just great. During the snow, I was looking at the bags of little pieces of fabric from projects past, thinking, i just have to do something with these. Well this is the perfect opportunity to encourage me to do something with these. I love telling people what to do! What a great challenge! I’m presenting this to my co-workers at the shop where I work and teach. Wonderful! Glad to have them aboard! I love the idea ! You’ll have to remind me to remind you. Glad to trigger a burst of creativity. I throw my scarps into a shoebox and when it’s full, I spend a couple of days playing with them, I cut the bigger pieces into squares and strips, and use the irregular shaped scraps to piece what I learned to call “mile-a-minute” blocks. I cut them to 6 1/2″ squares and then sash them. They make great throws or lap quilts for the nursing home. I am addicted to these. My scraps are usually larger than crumbs, so I’ll have to challenge myself to make crumb blocks, too! I’m in! I have bazillions of crumbs and can’t wait to use them! I’ve been doing this for years. I always feel sorry for bits that go in the trash! Ha ha. Right now I have a box full of 4-1/2″ squares, each square is shades of one color. Someday I’ll have enough for a rainbow quilt. Thems be big crumbs, girlfriend. But hey, anything that nets another quilt is good in my book. The crumbs make up the 4-1/2″squares, lots of bits in each square. I accept your challenge. I like to make crumb blocks with my scraps, but never really use them. I have made some crumby looking quilts in my time, but have never made a true crumb quilt. 2014, will be my year of the crumb. Love it. As opposed to crumby quilts, which are something else entirely! Ha, ha! I know the above post is from the dark ages, but I have a couple of newer pieces in process. I use as a good way to keep my scrap baskets from getting over full. It is also fun to make new fabric. I started doing this after I saw an episode called “mosaic quilting” on Simply Quilts. Looks very similar, maybe just smaller pieces. Love your Red Journal! What a great thing to make! What a great idea for those starter/enders! 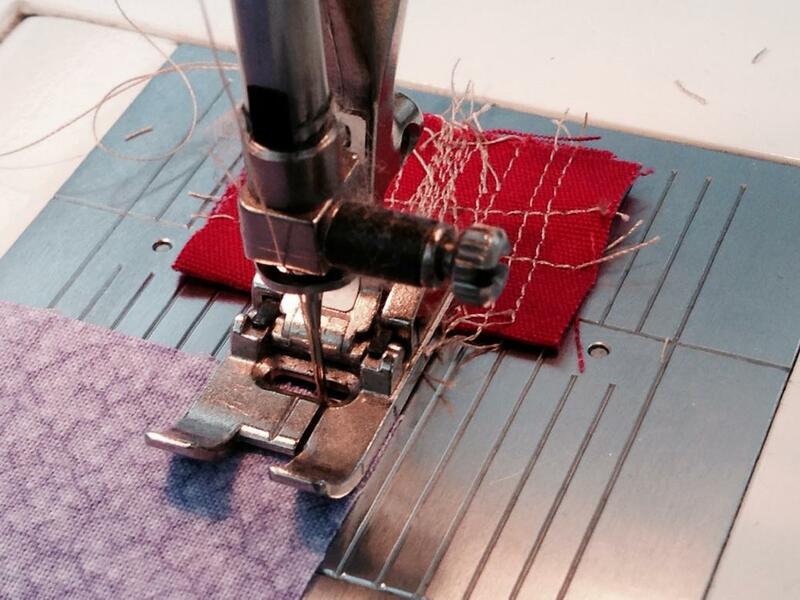 Much better to sew a seam to make a block than just build up thread on one piece of fabric. Seems like better use of the thread and your energy, doesn’t it? Unless you’re like me and you get confused easily. I’m crossing my fingers that I can sew two quilts at once. Double Trouble. I didn’t get the video nor a picture of the pillow. Love the ideas! I’ll try them next time. I have SO many scraps (I’ve been known to go through quilter’s trash to ‘rescue’ perfectly good scraps down to one-inch at quilt retreats….). So, I need to accept this challenge! Thanks for offering this, Ami!! Time to stop saving and start sewing! to Scooter from Maizy: I didn’t like your “wolf” sound in my house. And, I prefer licking my grandbaby’s face. I shall pass it on to Scooter. He prefers singing, but he does like licking too. Just not at the same time. His tongue is so big, there would be a danger of drowning for the little human people if he licked them quiet. Ami – Having nearly finished a partially paper pieced quilt, I’m wondering how tough it is to press and quilt over all those seams – do you have a trick for this as well? Probably pretty tough. I’d fold borders or sashing strips away from the crumb block and put in a sharp #80 or #90 when you’re ready to machine quilt through the “crumbs.” No way can you hand quilt this! I use a jeans needle to quilt through these. As for pressing… lots of steam! I have several friends who give me all their scraps since they know I’ll make charity quilts out of them. I’ve done several crumb quilts, so the challenge for me will be to come up with new designs. Heaven knows I have tons to use up. I have 2 storage drawers full of scraps in different sizes. Sounds like a fun way to spend evenings while watching TV (yes – have one in my sewing room). What a wonderful way to use them and create something beautiful. I’m in. 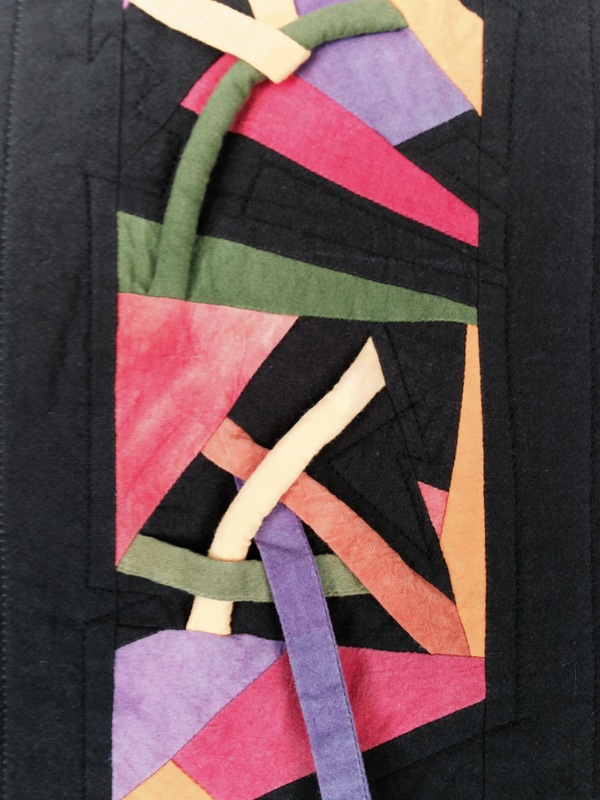 I accept the challenge…have been doing this lately on snow day quilting…! 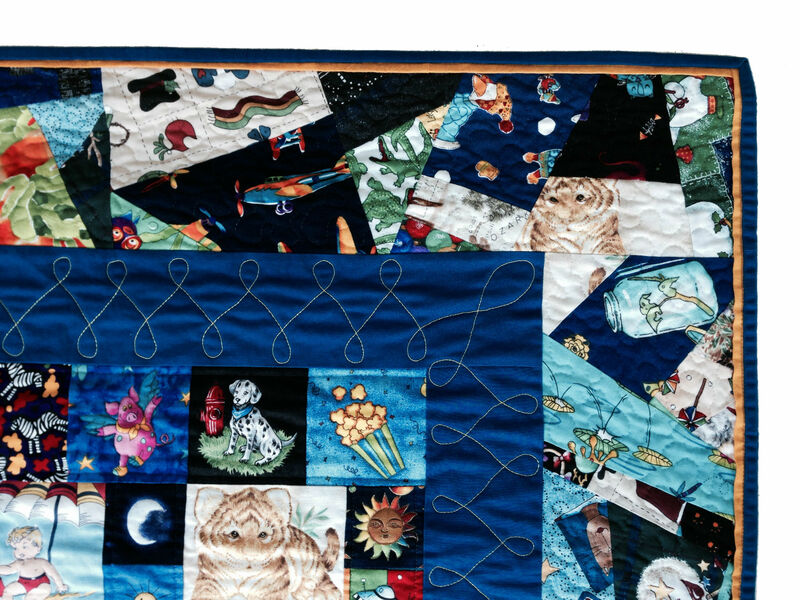 Ah…snow day quilting. I do like those. I’m in. I always use the little “starter” pieces and now it looks like I can be productive at the same time. I’m excited about trying this “second quilt” idea too! My friends & I made red/white/blue crumb blocks, sashed them and it made a great QOV! I made crumb placemats for when my quilt friends come to eat. Now I’m sorting through my huge mound of scraps and am going to make a modern crumb quilt. I have done many of these quilts but will try the confetti border this time for added spice! Give it a whirl! What have you got to lose, Suzanne! Count me in! I’ve been ‘collecting’ small bits of conversation prints for 30+ years, and had decided this is the (downsizing) year to use it up or throw it out, when, much to my surprise, in you popped to my mail basket with a perfect solution. Thanks, Ami!! Great timing, albeit totally accidental. Glad your new project popped up! That sounds like a lot of fabric bits! Don’t fall in the hamper! Count me in. I have a hard time throwing ANY of it away! In fact, I don’t. My aunt volunteers at a community thrift store. They recycle textiles. The funds generated from the clothing/fabric recycling, is put towards the food pantry. I no longer feel guilty, AND I’m able to “let go” of some pieces I would have otherwise held on to. Win-win-win!!! I’ll say! What a great idea. I have a collection of wonderful plaid shirts from Salvation Army, bought totally on spec. They are percolating. I’m in. I have cut a bunch of 2″ x 8″ strips of phone book pages and am using those as a foundation to piece my little crumbs onto. I used some for a border on small quilt. Little pieces with big pieces. Can’t wait! OK, I’m in! Well, I have to admit I already have a head start. For awhile there, I was piecing my crumbs together and making 6 inch blocks. But I was getting too analytical about it, making sure that the crumbs were the right size, so that I didn’t have to cut off to much, and I didn’t want to have a seam too close to the edge, etc. So I put them away. I am going to resurrect them and try to be more relaxed about it….. By the way – in answer to your question about QOV – it means Quilts of Valor, and it is an organization that makes quilts for wounded veterans. QOV! Duh! I knew that! Glad you’re in! Relaxed is way better than the other thing. Enjoy! You probably already know this but Bonnie Hunter over at Quiltville.com has been doing the Crumb blocks for several years too. I have a top with some 6 inch crumb blocks to honor my grma’s Kitchen Sink type of quiltmaking but still need to add some appliqued words to the border. When I get it done I will send a picture. I got the idea for a quilt from our Bee’s challenge where I was assigned Grandparent’s Day as my holiday theme. I am still making more of the crumb quilts but don’t make pillows out of the too small to sew leftovers. Awesome! Great minds think alike and all that. Looking forward to seeing your picture. I’m in! I have Christmas scraps that I love, so they’ll soon be living in close proximity together…. Hm…. I’m in – up to my ears in crumbs already! I’m in. I’ve been playing with crumbs more and more and have used the made fabric in quite a few projects. I’m definitely up for making (at least) one more this year. I would love to join this challenge!!! You betcha! Glad you’re in, Barb! This is going to be way too much fun! I’m in. I save everything and only rarely actually use any of them. So the challenge is a good way to keep me focused on scraps. Excellent, Phyllis! Glad you’re crumbing with us! Ok, as a relatively new quilter, my stash and my scrap supply are somewhat limited. My quilt friend says(referring to the quilt saying about she who has the biggest stash…) I WON’T be the last to die! So, I’m joining in the challenge, but perhaps my role will be as a cheerleader. Ask your friends for help. They’ll save scraps for you. It won’t take long. But cheer too. I like that. I keep most of my scraps and will begin sewing them this year! Good! Good! Good! Glad you’re in, Sue! Had been planning to do something similar with my crumbs. Never thought about a pillow for the rest! I’m in! That pillow is a great idea, isn’t it? All sewn and ready to stuff before she came to class. Brilliant! A Crumb Quilt is on my list of quilts to make, so I’m in! The pattern I have uses a 2 1/2 inch strip as the starting point to add the crumbs to. I plan on using up all my extra bindings strips to get started. Let’s see what you come up with! Glad you’re IN! I started making mile-a-minute fabric after reading an article in a AQS mag and made a big lap quilt for myself. Then taught it to my guild and also made lots of 6″ blocks and set them with strips and cornerstones and donated 2 quilts to YMCA for fundraising. When I would visit my sister I took a bag of scraps and over 2 or 3 yrs had enough for a small quilt for her and her husband. I have the picture on my iPhone and could send you a text with the pictures if you want. Also, count me in. Glad you’re in. You’ll have to tell us what mile-a-minute fabric is. In the dark…. Do our crumbs need a foundation backing? Or can I go for the gusto ? I just go for the gusto. I think a foundation would make it so thick as to be impractical. But then that’s just my opinion. I know people piece to a fabric foundation all the time. I just find it “faster and dirtier” to just piece. So, go for the gusto! Well, since I do save everything, I guess I’m in! Everything? Yes, you better join us! I accept the challenge. I have made several crumb quilts, so one more will be fun. And I accept your acceptance! Terrific! I’m in! 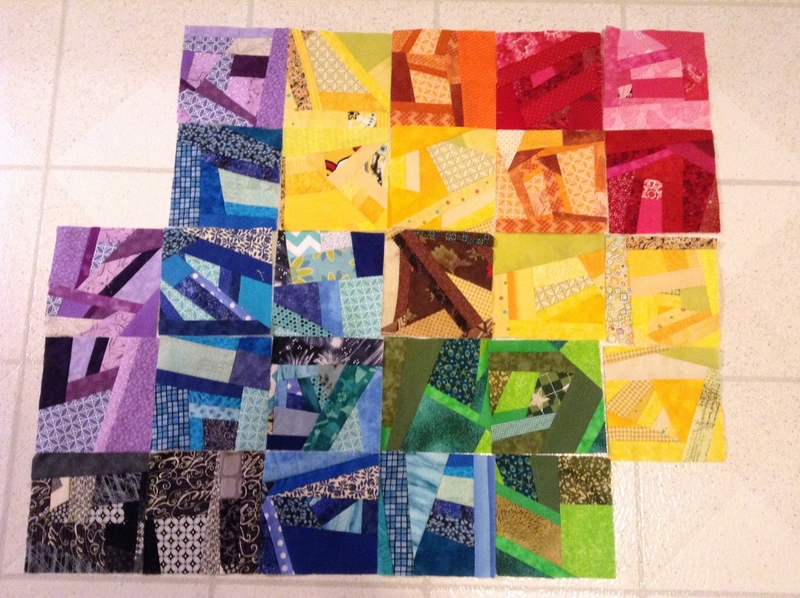 I’ve been making 3″ crazy squares with my littlest leftovers. Hope to put them into a classic-looking quilt. It’s a really good idea for “leaders” when chain-piecing. I’ve also done two photo quilts – thanks to your book from the early 90’s! When I make flying geese units I “resew” the little triangles that are trimmed. They are already rst and make the best, tiny, half square triangle units. I call them duck poop (hee hee). I’ve used duck poop to insert a row of half inch finished half square triangles in a quilt. Love this idea. I have a bucket of duck poop sewn and waiting for a home. This is the Megan from the video. Thanks for including me in your newsletter. I’m in for the challenge, too. Crumb-ing is addictive. My newest thing is reverse-appliqueing the crumb blocks and solid fabrics to make letter pillows. We’re goingn to need pictures of those pillows, Megan! You’ve started an avalanche of crumbs! Yay!!! I have been saving various bits and pieces of fabric in bag on the floor next to my sewing table. Was never quite sure what to do with them….now I do. I am in for the challenge. This is a great idea! I have some pieces I’ve cut into squares or strips that I can use, as well as some larger scraps I can cut down, I must finish the quilting on a throw for my MIL first, though, so I’m not actually piecing anything right now. But when I’ve finished Mom’s quilt, I’ll start making one for my DH for Father’s day from scraps from hers. These are from shirts that were my FIL’s; he died a couple of years ago. I’ll have some pieces left from that to include, I’m sure. I do have a question, though. Are the pieces to be cut into squares or just sewn however we can fit them together and then cut down into squares? I’ve heard of using used drier sheets or pellon squares for a foundation, which wouldn’t be very heavy. Looking forward to seeing all the great quilts! To be a true “crumb” no squares allowed. Random shapes puzzled together any which way, THEN cut into square shapes. I’d skip the foundation and keep the puddles of crumbs small. As grainline is going EVERYWHERE, Crumbed Blocks should be no larger than 6″ or else they start moving on their own power. Make friends with your iron and you shouldn’t need a foundation. I would sure like to do this, Ami, as I have lots of scraps to begin with, at least. So, I’ll give it a go. Thanks for the idea! I have enough mini triangles to make a small Christmas table topper. I call them “Therapy quilts” because I started the first one the day my mothre had a stroke and I needed to run a lot of fabric through a machine. 3 1/2 inches sounds a bit small for me so I’ll do 5″ for this challenge. Cathie, so sorry about your Mom. Quilting helps me cope too. Funny how quilting can be both joyful and therapeutic at the same time. Wonderful ideas, I have bags full of scraps that I need to create something with. Nice way to finally use up all the scrap pieces I’ve been accumulating in tooooo many plastic storage containers and turn them into something useful to donate also. Now will have to think of another use for those containers as I empty them. Any ideas Ami? I love containers. See through plastic? Lids? There’s no telling what you could organize next with those. I’m in too. started a few of these blocks some time ago. Now I’ll have a reason to make more and turn them into a quilt. Thanks for the challenge. I’m in! I was given scraps from an appliquer. 4 GARBAGE BAGS FULL!! No pieces larger than maybe 3″x3″. No squares. I wonder if i would go blind if i made the entire quilt in crumbs? Oh my! I think if you made an “All Crumb Quilt” you wouldn’t be able to turn over if you slept under it. Oh yes, a year is good. Not sure how much stash reduction will occur, but those stray little pieces should be a thing of the past. Yay, Louise!We’re rooting for you! Hi, Ami – I will accept the challenge! I will complete a wall quilt before the end of 2014. Linda Rigdon from Surfside Quilters Guild. Glad you’re joining us, Joanie! Well, now I feel guilty. I collect all the crumbs and take them to my local quilt shop. They collect them for a charity group that makes heart shape pillows for heart surgery patients and, use the crumbs for stuffing the pillows. Whenever the patient needs to cough or sneeze, they put the pillow on their chest, and hold it tight with arms crossed. This keeps any stitches from tearing. Maybe I’ll be forgiven if I compromise: any crumbs from a class go to the charity and any crumbs from home are used for a crumb quilt. Yes, with a now cleared conscience, I will join the challenge! Frank, absolutely NO REASON to feel guilty! Why don’t you piece the covers of the pillows with crumbs and then donate a completed pillow that is a work of art. Or, Frank, as the case may be. The real answer to machines that “unthread” themselves between every run or require you to hold threads back is to trade them in for a horizontal rotary hook, drop in bobbin machine – preferably a good Husqvarna Viking. With their newer models, you’ll also ditch the presser foot lifter too! I couldn’t imagine ever going back to a vertical hook machine – those always require more “thread control” on top… what a waste o’ time! Well, count me in also. I do what I call string quilts – the pieces are long and narrow and I use a foundation of an old sheet or some of that f material that you just had to have that BUT after washing was just too flimsy for anything. 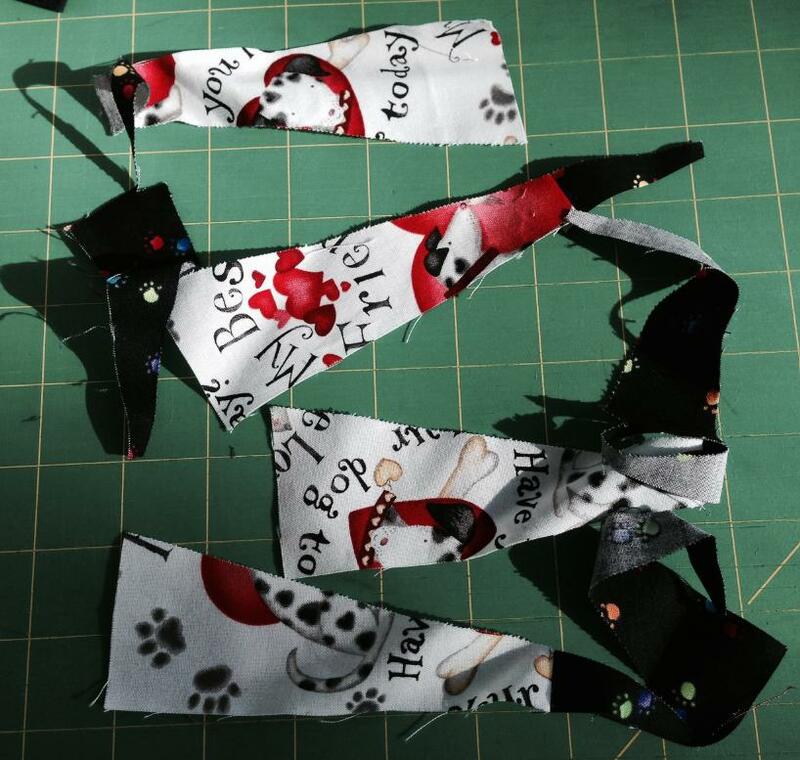 I precut in about 8″ to 10″andjust sew the strips in the sew and flip style. 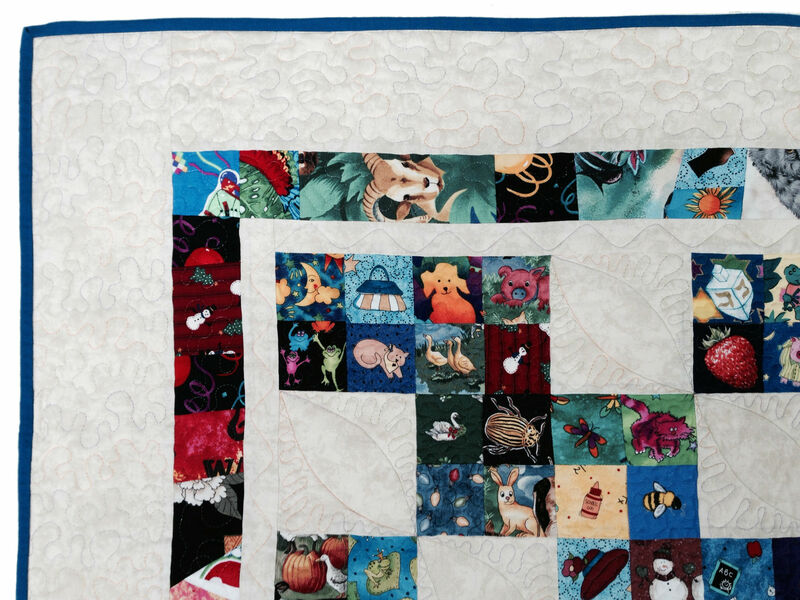 So, have a bunch of small pieces that don’t get into these quilts. I’m jumping in too! I hate to throw those little ones away- and have lots of bags full of scraps! I’m in! Sounds like a great challenge! I’d really like to do this I don’t think I can make a whole quilt, I’ve been making place mats this way for years and they are a favorite with my family. I can’t seem to make them fast enough. They are so pretty. I do like the idea about not making each “crumb” block bigger than six inches, that makes good sense. Thank you! Ami, it’s so good to see you looking so relaxed and happy. You did an incredible thing with AAQI and you should be extremely proud of it all! I am proud to have been a minute part of it though all I did was buy quilts. Love the placemat idea too! Hi!!!! I had just seen a blog earlier today about crumb quilts!!!! Then I found yours and it seems like I am supposed to give it a go!!!! Sounds like fun!!!!! Awesome! Glad you found it! I just finished my first challenge quilt. I thought the fabric was dull. But, by the time it was quilted by my friend it was bright and cheerful! leftovers and black. I have two machines set-up at all times. If one project gets boring. I just go to the other one. The challenge is on! Great Idea! I’m in – hard to pass up a fun challenge! I have sooo many batik scraps that this is the perfect idea for them. Is it too late to join in the challenge? It’s all year long, and then after that. Whenever is good. I’m in!!!!! I have been using starters and enders to join dresden plate pieces and small squares and do a lot of quilts that way. The scrap bags are a great idea. My friends and I fill them up quickly and give them to the local animal refuge. Dogs and cats don’t tend to chew them up like they do with polyester wadding filling. The bigger crumbs in the pillow will now have a new purpose. I tried this once before after making a picture play quilt using the OTF method. My husband and I made 24 quilts, mostly twin size, for the newly opened veterans homeless shelter last year…..and one of them ended up a “semi” crumb quilt. I had various pieces of black material,pieced together and then sashed in white………..wouldn’t ya know, that’s the one the vets wanted most! I have seveal totes of pieces…………..love the idea……I’ve always been a scrap-a-holic! Good for you guys! What wonderful gifts! Great idea. Count me in, please; if it’s not too late to join. The SCV guild is close to my heart, eventhough I moved to Phoenix about 8 years ago. I was doing a lot of batik totes and handbags with 2.5-inch strips. I had leftovers of all sizes and shapes. They were so pretty I could not bear to throw them away so I sewed them together into a rectangle that I used to make “Little Boxy Pouches” from Three Bears. One scrap was 3/4-inch wide, which means two 1/4-inch seam allowances to me, so one of the pieces in one pouch is a 1/4-inch wide strip. When I have triangle scraps, I make them into squares. Now I include at least one pouch (depending on the amount of scraps) to enclose with the totes and bags. People marvel at the tiny pieces and I love the compliments! “Kenny More” kept trying to push them into the space on the throat plate. lol But, they were scraps that were going into shelter pet beds. No worries, there were scraps from these scraps for the pet beds. Towards the end of the year, I’ll put a call out in the newsletter for folks to email me their pics and I’ll share them on the blog. Do remind me at the beginning of December if you remember before I do. Thanks! Great idea! I got so involved with the crumbs that I stopped making the original quilt blocks. Had to force myself to finish the quilt top after I did the crumb borders. It was so much fun and felt good to use all those scraps. Ha, ha! That’s great, Kathy! What a great way to use up the little scraps of which I have so many. Did you know they multiply in the night? They have to be for me to be getting so many! Anyway, we’ll see what I can do with them between now and the end of the year. Have fun with it, Pam! The crumby quilt is actually beginning to look like a quilt. It’s December 13 already. Can you believe it? How do we post photos of what we’ve got done so far? Send me an email with one picture attached and I’ll get it up there. Love the idea of the Crumb quilt and will me making a version of it. Also don’t miss the exhibit at the Flint Institute of Art. 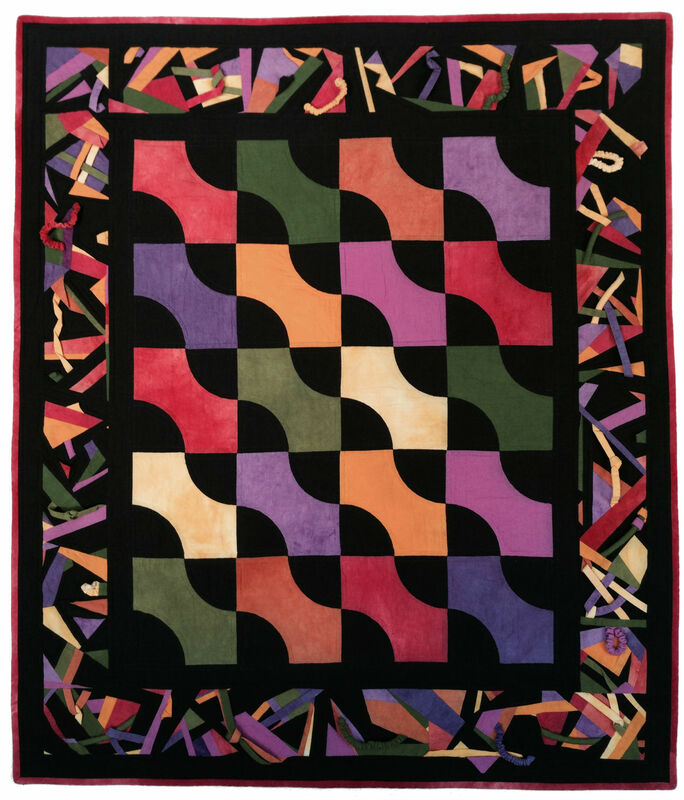 It featured some Gees Bend quilts. Very interesting.